2) I’ve noticed that ants carry pick up their dead and move them. I’ve learned that they do this to basically ‘take out the trash’ for sanitary purposes. But I’ve also noticed that these ants also carry their dead when they’re far away from any ant hole. So, referring to my other question, if it’s true that ants do take the solid food back to their larvae, then are these ants carrying their dead back to their larvae for consumption? Assuming ants are cannibalistic, which I’m not sure of. Recently I photographed some clues that might shed some light on your ant carrying mystery. 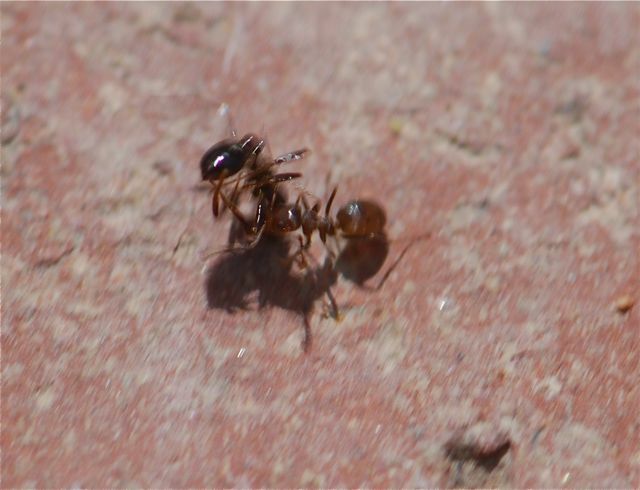 This Forelius worker is carrying another ant. She carried it right back to the nest and dragged it in. Notice, however, the dead ant has two “nodes.” It is a worker of Solenopsis xyloni from a nearby colony. The area around the Forelius nest was strewn with Solenopsis parts. Many ants will carry fallen foes back to the nest as food, as well as the enemy colony’s pupae, larvae and eggs. In that way, ants are indeed cannibalistic. It makes sense to process and eat healthy enemy ants. It does not, however, make sense to eat dead ants from the home colony because they may be diseased or have parasites. Worker ants do carry their dead nestmates to the refuse heap, as shown by the famous ant scientist, EO Wilson in the 1950’s. 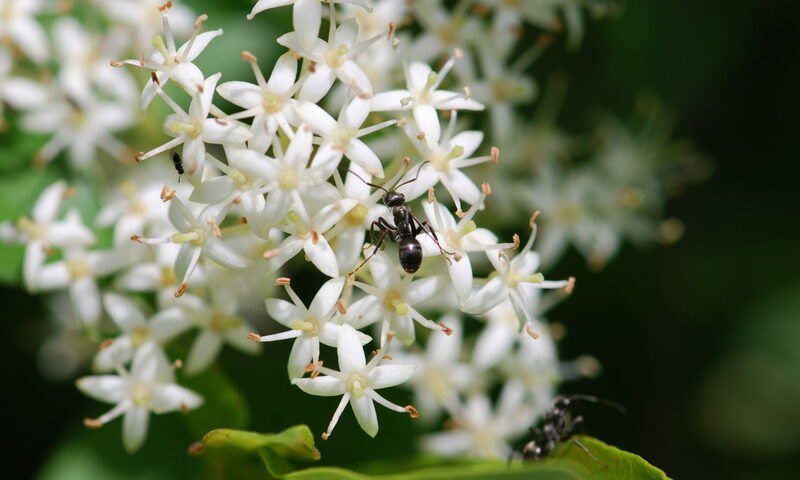 Wilson figured out that chemicals were involved in the recognition of dead ants, particularly oleic acid. When he dipped oleic acid on a healthy, living ant, her sisters still dragged her off the the ant graveyard. The ants was not allowed back into the colony until she managed to clean herself up. 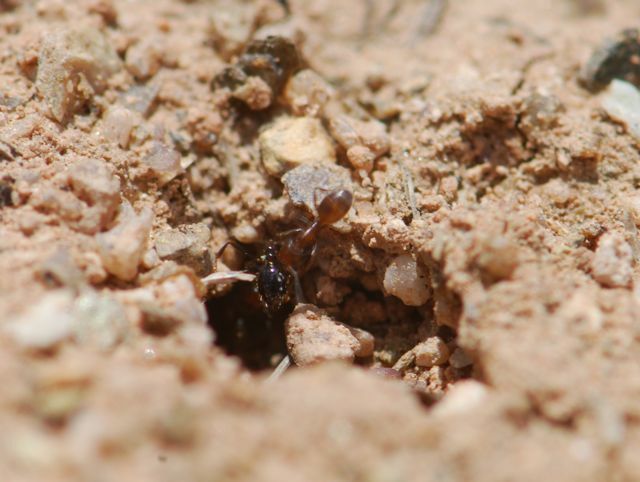 Finally, worker ants sometimes carry live ants as well.